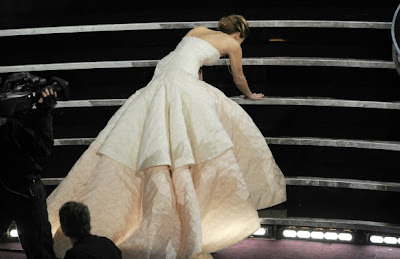 Jennifer Lawrence was left red-faced when she tripped up the stairs as she made her way to collect the award for Best Actress at last night 's Oscars. You'd think after all the awards she's collected this season, Jennifer Lawrence would be used to climbing stairs to the stage. 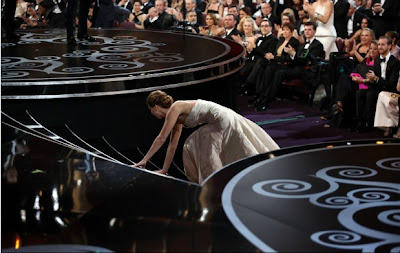 Not so: She stumbled a little tonight on the way to collecting her Academy Award for best actress for Silver Linings Playbook. It wasn't a terrible fall, with her sprawled on the stairs, but she did trip on the first step, covered her face with her hand, then recovered quickly and laughed. When she reached the stage, she joked to the audience giving her a standing ovation, "You're only standing up because I fell on the stairs. I feel so embarrassed." X Men actor Hugh Jackman rushed out of his seat and tried to help Jennifer, but French actor Jean Dujardin, who presented her with the award, got there first. Possibly she couldn't see where she was going due to the extra wide, thick mermaid-style swell of her Dior haute couture gown — she's the face of the Miss Dior line. On the red carpet, she told reporters that she and her stylist had six inches taken off the train because it was so long. Backstage, reporters asked if the fall was "on purpose." "Absolutely," she joked. "What do you mean, what happened? Look at my dress! I tried to walk up the stars in this dress. They wax the stairs." What went through her mind when she fell? "A bad word that I can't stay that starts with 'F,'" she said, laughing.